This week's topic: What are some of the cons you've discovered when it comes to blogging? The two main problems I have with blogging are essentially two sides of the same coin. Side one: sometimes I just don't feel like blogging. 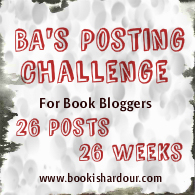 There's more than one failed (sorry, "on hiatus") blogging challenge in my blog history. There's stretches of weeks at a time where I post nothing. I think I'm learning to not do daily blogging challenges because that's what I struggle the most with. This weekly one is going well so far though. Side two: sometimes when I blog I have verbal diarrhea and spit out long, rambling posts that are quite possibly only of interest to me (see yesterday's post for an example, 1800 words after excluding the block quotes). Sometimes I just really, really want to write, and write, and write. So my blog swings from nothing at all to overloaded and back again with alarming rapidity. Luckily, because my blog is pretty small and personal and not 100% focused on a particular theme, I get very little spam or hate mail. But I know other bloggers (especially Fat Acceptance bloggers) who get daily hate mail and even death threats. So I know I'm lucky in that regard. Otherwise, no real disgruntlement here!